'Scarab' (Marky Smith, R. 2015) Seedling# 11-16S. AB (OGB-), 25" (64 cm), Early midseason bloom. Standards clematis violet (RHS 83A); style arm crests and midribs brown, pale cream sides; falls wide greyed red-violet band (greyer than 187B), centers green-cream veined darker red, center dividing line from small black-red spear signal at beard tip, ring of smoked dark red dashes under beard; beards dark brown; partially recurved; slight spicy fragrance. 'Hannah's Prayer' X 'Brash'. Aitken 2017. From Aitken's catalog, 2017: SCARAB (AB) (M. Smith '17) AB (OGB-) 26” (66 cm) EM. The sacred Egyptian seal for a royal addition to your garden, and very different from Afreet. Upright, royal purple standards; style crests and midribs brown with pale cream sides. 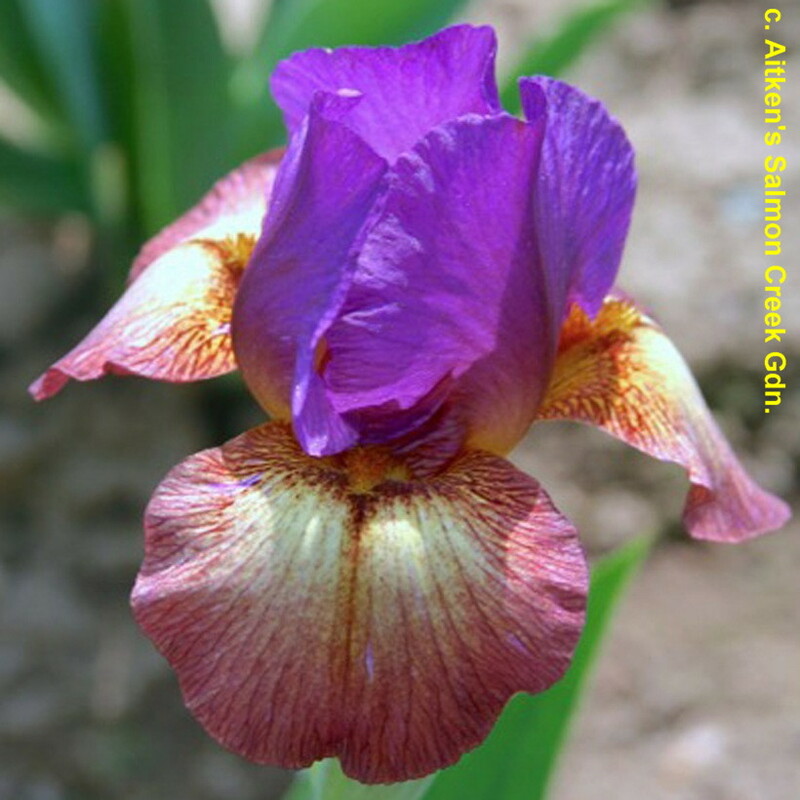 Falls are rimmed with a wide red-violet edge, fall centers are greenish-cream, veined darker red. A brown spear centers the petal below a small black-red signal at the violet beard tip. Smoked dark red dashes form a ring under the dark golden-brown beard. Some recurve to the petals. Slight spicy fragrance. Sdlg, #11-16 S: (Hannah’s Prayer X Brash). SKU: 17AB107. $25.00.